Many important components of the hair structure are lost through lash forming. We restore these lost components with the proteins in our keratin boost. Eyelash dyeing also damages keratin layers. So if eyelashes have also been tinted during lash lifting, it is even more important to treat them with our specially designed products. 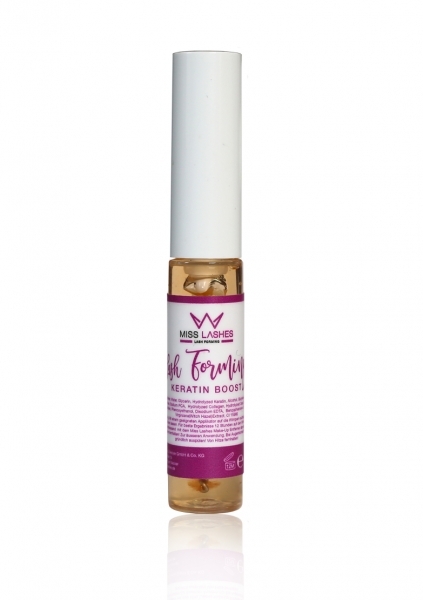 Our Keratin Boost penetrates the hair shaft, adheres to cracks along the cuticle layer and fills the damaged hair with care substances, coats it - additionally encloses the active ingredients and makes the eyelash hair smoother and healthier again. The keratin is also intended for use at home. Recommended retail price is 19.90 €.